Sophomore communication major Alizae Dollins is heavily involved in community service, is one of the few students enrolled in Virginia Wesleyan College’s Portfolio Program, plays both basketball and track and field, leads tours for incoming students as an Ambassador and serves as a peer advisor under Director of Instructional Technology Robin Takacs. She says she does it all for her brother who passed away before the age of 10. “I try to do a whole bunch of sports so I can keep myself involved,” Dollins said. Dollins originally came to VWC after Head Basketball Coach Stephany Dunmyer recruited her from an AAU team in high school. 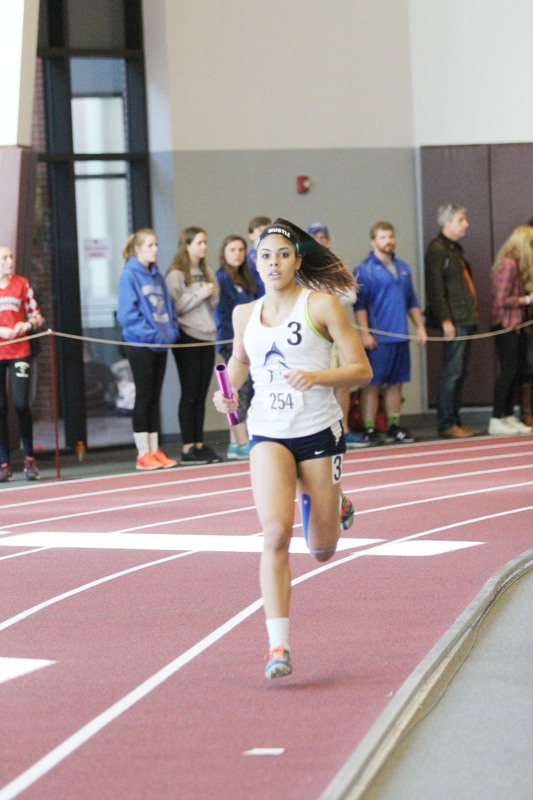 After playing one season of basketball, her mother and Visiting Instructor of Recreation and Leisure Studies Takeyra Collins encouraged her to try out for Track and Field. “She was like ‘you know you should really do it, it’s something that you were really good at in high school,’ like ‘you never know.’ But I was really iffy about it because I was like ‘I don’t know anybody that’s on the team’,” Dollins said. Dollins eventually decided to follow the advice of her mom and professor, playing her first outdoor season last year. In the fall of 2016, she played both indoor track and field and basketball. “I’m pretty much tired all the time,” Dollins said with a laugh. While Dollins’s athletic achievements are impressive, it is her commitment to integrity that Takacs, the instructor for the Freshmen Year Experience class that Dollins peer-advised for, finds so refreshing. “She feels really strong about her commitments and following through her commitments,” Takacs said. Takacs felt she could really trust Dollins to follow through for her in peer advising. Takacs explained that as an FYE instructor, she would occasionally step out of the classroom so the students could speak openly with Dollins and the other peer advisors. It takes a lot of trust to leave a classroom of freshmen in the charge of three older students, but with Dollins, Takacs felt like it was safe. “She is definitely one of those people that anything I’ve ever asked her to do, she’s done,” Takacs said. As a peer advisor, Dollins is humble and honest with freshmen students, not afraid to share her heart with the classroom. Takacs describes her as truly courageous. “It takes a special person to want to appear vulnerable and not like a know-it-all…she’s never afraid to share, she’s courageous,” Takacs said. Dollins lives fully in each moment, giving her all even when she is benched. “I think everything she does, she tries to give it 100 percent. Even when she is not the star of the team, she just gives her all to it, even though she’s not the tallest player… I would say she’s the one with the biggest heart,” Takacs said. Dollins’s road to success was not easy. Originally from Texas, she moved with her mother and younger brother to Germany and then to Japan where she lived for a little while. It was while in Japan that tragedy struck the family, and her younger brother passed away. When she was 13, they then moved to Delaware where Dollins began to rebuild her life. In between Japan and Delaware, it took a while for life to settle down and for the mother and daughter duo to financially get back on their feet. Prior to settling in Delaware, Dollins had been in a new school district every year, had bounced around different apartments and even spent some time in a woman’s shelter. Thankfully, by 8th grade, things began to improve. “It was different being in Delaware. I feel like it was a new start for me and my mom because I was able to stay with my friends I had made in 8th grade and I stayed with them all the way through my senior year,” Dollins said. They were able to buy a big house, Dollins got a job, and things were looking up. However, it would take a little longer for Dollins to be able to speak of her experience. “When we left Japan and we came back to the States and we started living in Maryland, I tried to like create a new life like it never happened… we would have pictures in our rooms and pictures in my mom’s cars and my friends would be like ‘who is that little boy’ and I would just be like, ‘oh, that’s my cousin,’” Dollins said. It was later on in high school that Dollins began to share her past with her close friends, beginning the journey of vulnerability that those close to her so admire. When describing her dating relationship with senior Tim Jones, Dollins couldn’t help but smile. She explained that he has been a huge encouragement to her. “I think it’s really good having him around because he helps me calm down. He’s just a really good side-kick,” Dollins said. Jones has become like a son to Dollins’s mother. Mrs. Dollins is even helping Jones design T-shirts for his new brand called “Tru 2 T,” a program aimed at encouraging kids to focus on sports and school instead of gang activity. Dollins stresses the importance of living every day to the full. “You don’t get tomorrow. Tomorrow has no promise. Do what your heart tells you,” Dollins said.